Our component art gallery exhibits sculptures by artists who work with both high and low tech component materials derived from life in the 20th and 21st centuries. 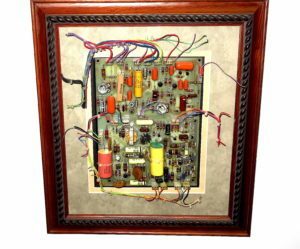 Sculptor and Cinema Antiques Founder, Bill Reiter, uses materials in his work, such as vintage circuit boards, integrated circuits, chips, digital and analog components, tubes, drives belts, resistors, transistors, connectors, rheostats, potentiometers, gauges, analog and digital readout displays, gearings and a host of other component materials that have been used to fabricate equipment and controls of our past and current daily lives. Pieces are wall-hung sculptures, free-standing sculptures, shelf displays and desk paperweights in various sizes. By shaping various technical components, from the past and present, into specialized design pieces, Reiter shapes an organic vision based on the materials that effect and often control our daily lives. This view of the ‘stuff of life’ aggregates and separates the components of our lives into a shared vision of life among the ‘components.’ “They are all around us.” By mastering, repurposing and controlling these component bits, we may gain a better look at where we come from, as well as seeing the hardware, salvage, surplus and artifacts of our society in all of its negative as well as positive influences. Clients have sent us ‘components’ from their lives and ask us to shape them into sculptures by refinishing and otherwise bringing new life to these components and make them displayable and more meaningful. 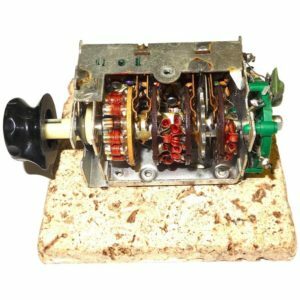 A flywheel from a 1949 DeSoto, a rectifier from an old family radio, a mainframe from a 1960s computer that started a company off and running. All the parts and ‘components’ of our lives are asking for respectful preservation and design objectification. If you have your own components and would like to discuss project details or pricing, please contact Cinema Antiques for more information.